Water management and drought forecasting traditionally meant physically measuring surface water or groundwater, but Arizona State University researchers are tackling the problem in a new way: from space. Werth and Manoochehr Shirzaei of ASU’s School of Earth and Space Exploration (SESE), together with Yuning Fu of Bowling Green State University, have received a $550,000 grant from NASA’s Earth Surface and Interior focus area for a three-year study to use satellite data to more accurately measure water resources in California and predict future water availability. ASU’s involvement represents the latest from a university that has become known for ventures into space. In this case, ASU researchers will analyze data from a mission known as GRACE and other satellites, but the school also has high-profile connections with NASA that include Psyche, a first-time attempt to explore a metal asteroid; LunaH-Map, which aims to find water on the moon; and OSIRIS-Rex, which seeks to collect a sample from the asteroid Bennu and bring it back to Earth. While past studies on water resources and drought have focused mainly on low-resolution surface or groundwater measurements, this new study will combine strengths of several Earth remote-sensing techniques, including satellite gravimetry and satellite radar interferometry, to help provide faster, more continuous, more consistent, higher-resolution and cheaper water-related surface and subsurface observations. 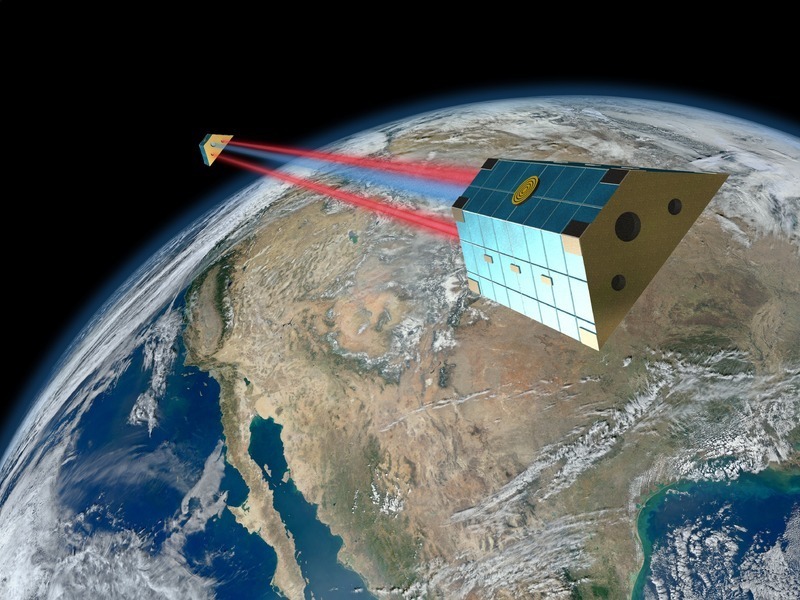 Gravimetry, which measures changes to the gravity field caused by water mass budget variations through the Earth’s hydrological cycle, will be provided by the twin-satellite mission Gravity Recovery and Climate Experiment (GRACE). The researchers also hope to collect data from GRACE-FO, which is expected to launch at the end of 2017. Changes in the hydrological cycle also lead to height changes of the land surface, which can be measured using space-borne Interferometric Synthetic Aperture Radar (InSAR), a method that uses radar images to generate maps of surface deformation using differences in the phase of waves returning to the satellite. While California was chosen because of its severe drought and water management crisis, the team hopes to expand the study to the southwestern U.S., including Arizona. The results of this research will contribute significantly to ASU’s Future H2O program, which seeks to face the challenges of climate-change water insecurity through wiser design principles, new data and algorithms for better water governance and business outcomes, and scalable nature-inspired technologies. NASA’s Earth Surface and Interior focus area (ESI) supports research and analysis of solid-Earth processes and properties from crust to core. ESI uses NASA’s unique capabilities and observational resources to better understand core, mantle and lithospheric structure and dynamics, and interactions between these processes and Earth’s fluid envelopes. ESI studies provide the basic understanding and data products needed to inform the assessment, mitigation and forecasting of the natural hazards, including phenomena such as earthquakes, tsunamis, landslides and volcanic eruptions. They also use time-variable signals associated with other natural and human-caused disturbances to the Earth system, including those associated with the production and management of natural resources. ASU's field painter is off to paint the Super Bowl field — for the 22nd time. With a little paint and a lot of footsteps, Peter Wozniak transforms a patch of green grass into a maroon-and-gold emblem that incites thousands of football fans. Wozniak is in charge of painting the field at Sun Devil Stadium — a job he has done since he was student worker in the late 1980s. And while creating 70-foot pitchforks is still a joy, he has been gratified to have his work displayed on the biggest football stage of all — the Super Bowl. Wozniak leaves this week to begin painting the field at NRG Stadium in Houston for the Super Bowl, which will be his 22nd time working the big game. His efforts will be seen by more than 160 million people around the world when the game is broadcast Feb. 5. Wozniak, the athletic facilities maintenance manager at ASU, has painted the field for every NFL championship since the 1996 Super BowlThe Cowboys beat the Steelers 27-17, and Diana Ross performed at halftime., which was held at Sun Devil Stadium. Brian Johnson, ASU’s athletic grounds facilities manager, has worked with Wozniak at most of them. It takes three weeks for Wozniak and his team to organize the three trailers full of equipment and then paint not only the main field, but all the practice fields and rain covers as well as sites for the NFL Experience, the fan festival held during Super Bowl week. They typically work 70-hour weeks leading up to the game, and have to accommodate many hours of rehearsals by the halftime performers. Weather is sometimes a challenge. Wozniak’s team had to deal with snowy conditions at the 2014 Super Bowl at MetLife Stadium in New Jersey. The cold wasn’t unfamiliar, as Wozniak is originally from New York, transferring to ASU as a student in 1986. He stayed on after graduating, and now painting the field is a tiny — but glamorous — part of what he does. “Right now, I have students packing clay at the softball field, but that’s not as exciting as painting the football field,” said Wozniak, who is in charge of the stadium, the practice fields and the soccer, lacrosse, wrestling and softball facilities. The summer after he painted the field for the 1996 Super Bowl, the NFL asked Wozniak to go to Monterrey, Mexico, to do the field for a game between the Kansas City Chiefs and the Dallas Cowboys. That led to jobs at the subsequent Super Bowls and dozens more international games. He has traveled to Mexico City, Tokyo, Sydney and London. Not too much has changed over the years. “The football field still has white lines, numbers, hash marks. We do more branding now,” said Wozniak, who grids out the end-zone designs on graph paper. “We’ve learned ways to make our jobs easier — what type of paint to use, painting tips and the sequence of events, so we’re more efficient,” he said. Wozniak said that because he has more people and more time, he’ll get to be more precise with the Super Bowl field design. But otherwise, it’s similar to painting the pitchfork at Sun Devil Stadium. Pete Wozniak painted the field for the Pro Bowl that was held at the University of Phoenix Stadium in February 2015. Typically, Pete Wozniak works 70-hour weeks for three weeks while painting the Super Bowl fields. He did the field at Levi's Stadium in Santa Clara, California, for Super Bowl 50 in February 2016. Pete Wozniak and his team dealt with cold, snowy conditions the week before the game while painting the field at MetLife Stadium in New Jersey for the 2014 Super Bowl. Pete Wozniak, shown here at MetLife Stadium for the 2014 Super Bowl, will head to his 22nd Super Bowl this week.